Last year my grandson Ben caught his first ever bass on a float-fished worm. I have to say he was pretty chuffed with the catch. 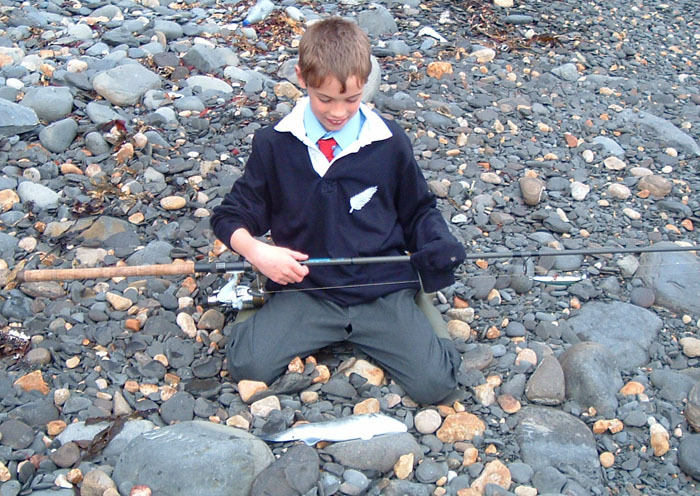 Anyway, what with school and winter (why do all these things get in the way of fishing?) Ben and I haven't been down to the coast together for ages. This week because Ben's Mum has been away on a business trip and with his Dad being very busy at work Ben came to stay with us. Although he's just 9 - every evening Ben has lots of homework and yesterday was no different. As I drove him home from school I suggested that, if he did his homework straight away, we might find time for an hour down at the sea shore - I've never seen a load of English grammar done so quickly. We bolted down our dinner and set off for the beach. We arrived just before high water and set off along the shore. Several of my friends had obviously had the same idea and round the first bend we met David Baker - already plugging away. It was a lovely, calm evening but there was a bit of a swell and I warned Ben to keep well back from the edge as he was wearing Grandma's wellies and should try to keep them dry. David joined us and after a bit of a hike we arrived at the chosen spot. My pal Adrian was already fishing and said that there had been one or two mullet moving on the surface. We watched for a minute or two and saw a couple of bass boil right in the margins - promising! However, the fish then seemed to fade away and we saw no more sign of them. Ben had never cast a plug before and since the one on our spinning rod was armed with two big, sharp trebles I thought that I'd better keep an eye on him, so I decided not to fish, laid my fly rod down and watched him casting. He soon got the hang of casting and it wasn't long before the plug was sailing out to sea. There was a bit of drifting weed in the water but it did not cause too much of a problem. Including Ben there were five people spinning and one chap fly fishing so we were hopeful that if there was anything about someone would make a catch. Sure enought on about his fourth or fifth chuck Ben's rod whanged over and he was into a fish. As he played the bass towards the beach his face was all smiles. Now Ben's caught some decent fish before but they've all been on bait. This one was not a monster but no one else had had a bite and it's always hard to believe that a fish will grab that bit of hard plastic until it happens. There's nothing like that first, lure-caught fish to give you a bit of confidence. 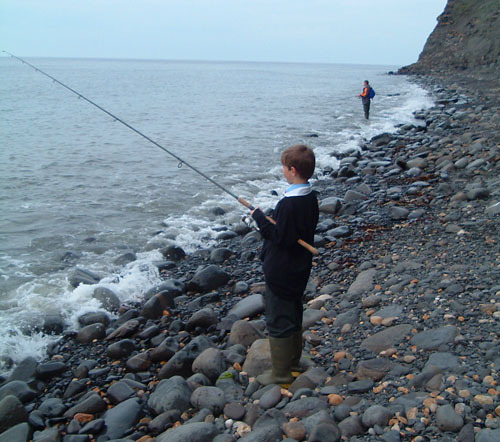 Soon after catching the bass the inevitable happened - Ben ventured too near the waves and Grandma's wellies filled up with water. Another five or ten minutes and he was saturated from head to toe so I decided that honour was satisfied, said goodbye to the others and we packed in and walked back to the car. 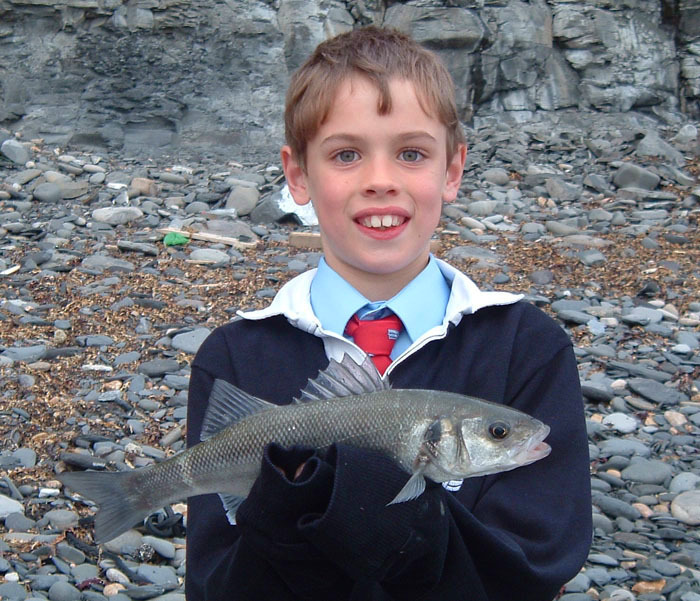 I put my old coat on the seat to protect it from the worst of the salt water and Ben (sans soaking wet trousers, boots, socks and jumper) travelled home well satisfied with his first, lure -caught bass - what an evening!